Sometimes nothing can beat classic white seasonal home decor for wintertime. Of course, white can also be a great home decor accent any time of the year. Last year we created a frosty felt wreath that we kept up in the studio all winter long. 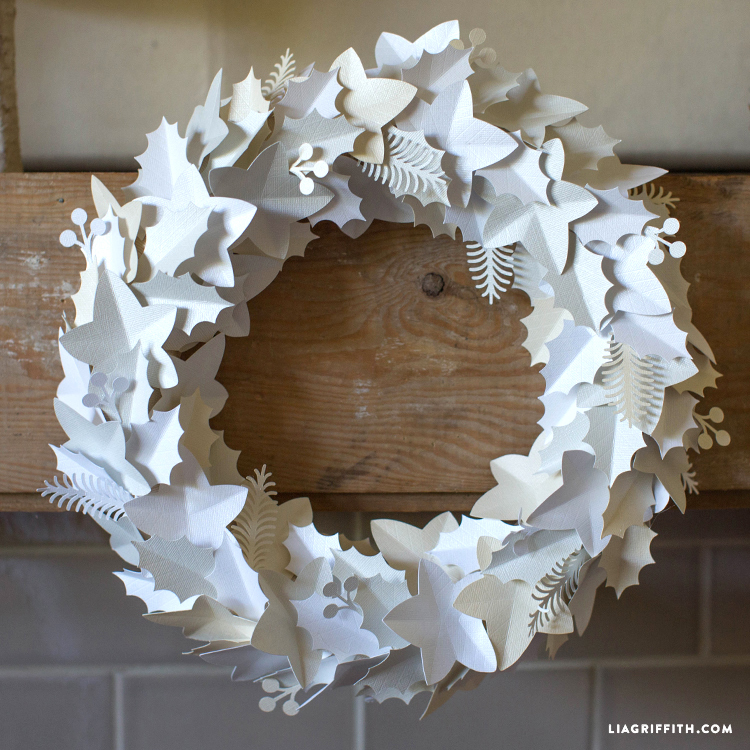 This year we are swapping the paper for cardstock to make this equally gorgeous DIY winter wreath. You can easily customize this wreath with any color scheme you would like, but to capture the snowy offerings of the colder months, we stuck with this neutral color palette. To add a bit more interest, we used various shades of white and cream for depth. 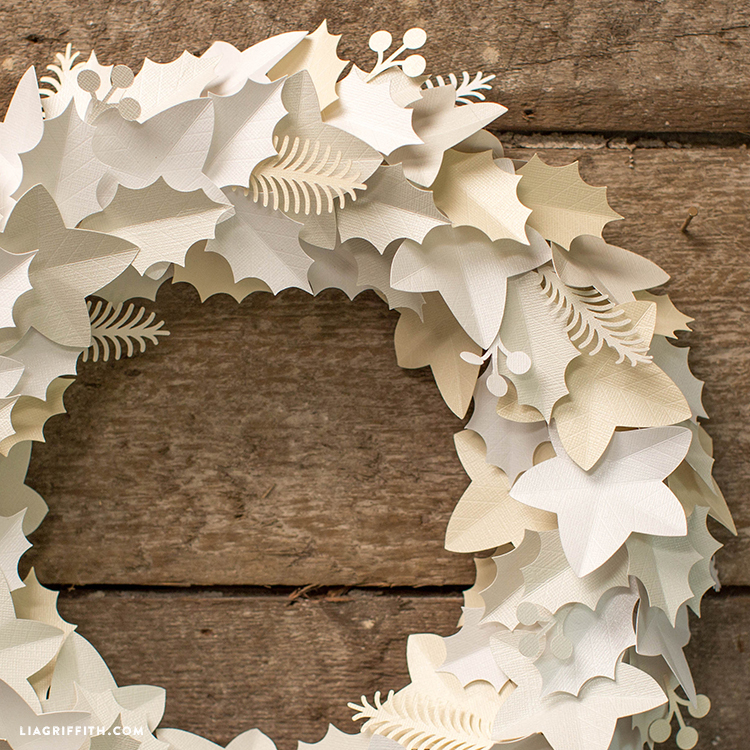 You will only need two materials for this DIY winter wreath, paper and a basic foam wreath form. Find both at your local craft store! Pick out your cardstocks and then choose which size wreath form you’d like. Another great option for this wreath is text weight metallic paper. When you’re ready to start crafting, download the PDF file if you are cutting by hand or the SVG to use with a cutting machine. As you probably guessed, we used our Cricut cutting machine, and you can find a link in Shop this Project. There is no real tutorial for making this DIY winter wreath, it really is all about the vision that you would like to customize! 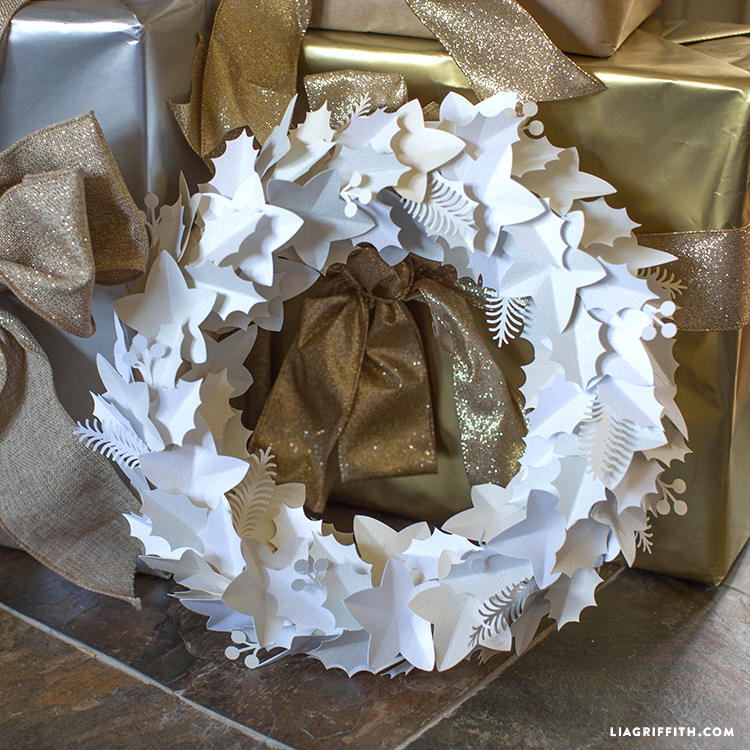 What is the best type and shape of wreath to use for the winter white paper wreath? We prefer the green hard foam wreath forms (wrapped with white ribbon in this case), but a white version would work as well! Any idea how many of each shape I would need? Hi Mamie! We would start out with 15-20 of the smaller pieces and 25-30 of the larger pieces to achieve this look! It all depends on how big the wreath you’re making is and how full you would like the final look to be. We hope this helps! So that’s what I did wrong on a paper wreath–didn’t have all the leaves going in same direction!! Thank you got that precious tip! Love this one!! It will be my January project!